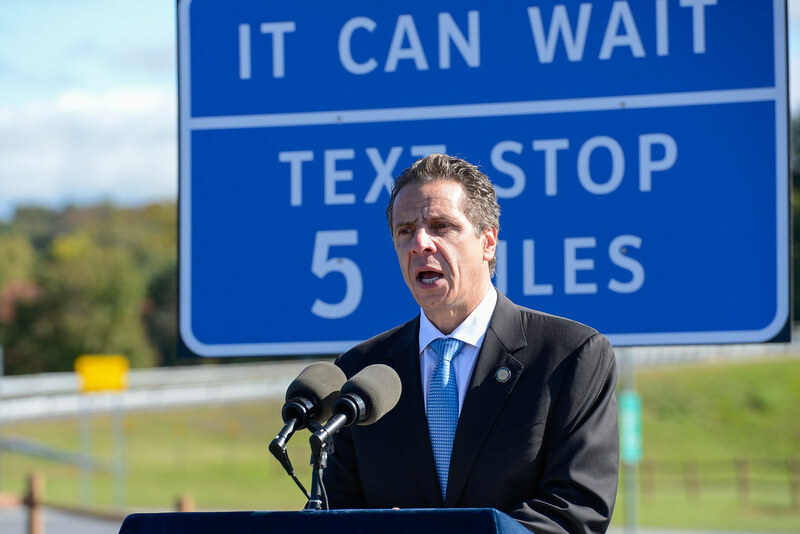 NEW YORK STATE (September 23, 2013) – Yesterday, Governor Andrew M. Cuomo continued the state’s efforts to reduce distracted driving by unveiling special "Texting Zones" along the New York State Thruway and State Highways that will give motorists a pull-off area to park and use their mobile devices. Existing Park-n-Ride facilities, rest stops, and parking areas along the Thruway and Highways will dual-function as Texting Zones, and signage will be placed along the highway to inform drivers where the Zones are located. A total of 298 signs will be located along major highways across the state, notifying motorists to 91 Texting Zone locations. In addition, the Governor announced a 365% increase in tickets issued in summer 2013 compared to summer 2012 for distracted driving, a result of an extensive enforcement crackdown by the State Police. This summer, State Police issued 21,580 tickets, surpassing last summer’s total of 5,208 tickets. The summer crackdown, which started on the July 4th holiday weekend and lasted through the Labor Day weekend, consisted of increased enforcement and patrols, particularly through undercover operations using unmarked State Police SUVs to catch distracted drivers. The campaign was in addition to two major efforts initiated by the Governor earlier this year to crack down on distracted driving – increasing the penalty for distracted driving from three to five points on a driver’s license and signing his legislation to increase license suspension and revocation periods for distracted driving on young and new drivers. State Police have been using Concealed Identity Traffic Enforcement (CITE) vehicles as part of the operation in order to more easily identify motorists who are texting while driving. CITE vehicles are SUVs that have platforms higher than an average vehicle, allowing officers greater ability to see into other vehicles and detect individuals in the process of sending text messages. The State Police fleet of CITE vehicles are unmarked and come in a variety of colors to ensure that they blend in with traffic on the road. They are also equipped with hidden high intensity emergency lights.